In a general sense, the holy grail of archaeological finds is a royal tomb. These burial sites often paint a much richer picture of ancient social (and certainly material) life precisely because the ultra-wealthy of the ancient world left so many more possessions behind. They are also, of course, immeasurably valuable treasure. To stretch the metaphor just a bit farther: Isn't it exactly the kind of site that would make the perfect target for that adventurous archaeologist, Dr. Indiana Jones? Such discoveries naturally provide insights into how power and status worked in bygone civilizations. The presence of large amounts of gold with the entombed is the hallmark clue that the person was a member of royalty or nobility. Predictably, many royal tombs across Egypt were looted during antiquity. Finding the chambers with their treasures intact today is exceedingly rare; in most cases, only the mummified remains were left undisturbed by grave robbers. What's more surprising is that the same happened across modern-day Kazakhstan, home to the ancient Saka culture that thrived 2,800 years ago. Today, Kazakhstan is known for having one of the world's most productive gold mines, as well as for accumulating rather large gold reserves relative to the size of the Central Asian country's economy. The Saka people apparently shared this affinity for gold with the modern inhabitants of Kazakhstan. According to an exciting report in the U.K. by the Daily Mail, thousands of gold coins, jewelry, and other valuables were found at a royal burial mound in Kazakhstan's Tarbagatai mountains. Archaeologists have identified about 200 similar Saka burial mounds—most long ago looted—scattered throughout the mountain range. This hoard includes a total of over 3,000 items. 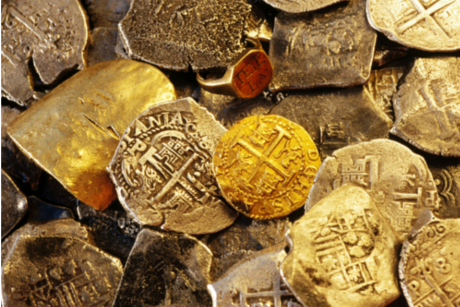 Much of it is in the form of gold jewelry, but it also includes some interesting gold proto-coins (discs, really). While burying precious metals and other status symbols in ancient tombs can tell contemporary observers about power and wealth in antiquity, the designs, shapes, and other qualities of the ornaments themselves also offer a window into societies of the past. These details about the artifacts found at burial sites are clear and tangible evidence of how advanced a culture's mastery over smelting and refining metals was. In places like China and Mesoamerica, previous assumptions about when ancient civilizations achieved various stages of development (e.g. from the Iron Age to the Bronze Age) have been challenged by more recent research. The Saka possessed surprisingly sophisticated craftsmanship for the 9th century B.C.E. The gold jewelry found at the site has very finely detailed beads, chains, necklaces—all made of gold—and other intricately fashioned fabrications. Other fantastic ancient jewelry was recovered not far away by the same research team about two years ago.